June 2017's edition of UEFL's MLB Umpire Sabermetrics is now available and features 88 ejections and 669 Replay Reviews through 1,198 games played. Ejections and replays are both projected to decrease year-over-year, based on current rates. The attached Most & Least Accurate Umpires, Replay Review contains the top and bottom of the Replay Review table ordinarily found in the "Read More" detailed section of the monthly report. >> 88 Total Regular Season Ejections through June 30, 2017 (on pace for 178 ejections this season). >> Umpires were 63.0% accurate on calls associated with ejection. >> The Chicago White Sox led MLB in ejections. The Dodgers and Marlins tied for the NL lead. >> Manager Rick Renteria led MLB in ejections. Don Mattingly led the NL in managerial ejections. >> Umpire Bill Welke led all umpires in ejections. >> Chief Sam Holbrook's crew led all umpire crews in ejections. >> Most ejections occurred in the 7th inning; Ejections from 7th and on comprised 44% of all tosses. >> Most ejections occurred on Saturdays. Weekend series (Fri-Sun) featured 55% of all heave-ho's. >> The most common reason for ejection was Balls/Strikes, followed by Replay Review & Check Swing. >> All else equal, a team tied at the time of ejection ended up winning the game 80.0% of the time. >> 669 Total Replay Reviews, of which calls were affirmed 51.0% of the time (49.0% overturned). >> The Tampa Bay Rays used replay more than any other team, but were fairly unsuccessful. >> The Kansas City Royals were the League's most successful team in review (14-for-19). >> The WAS Nationals experienced fewer reviews than any other team, and were not too successful. >> The Blue Jays were the worst MLB team in terms of Replay success (8-of-27). >> Umpire Clint Fagan had a league-leading 15 calls reviewed, and was below average in outcome. >> Ted Barrett's crew led all of baseball in replay activity, and performed at league average. >> Umpire Chad Fairchild led in accuracy with all of his calls affirmed by replay (4/4). >> Umpire Dana DeMuth experienced the highest rate of his calls being overturned by replay (0/4). >> The 7th inning had more reviews than any other inning. 44% of all reviews occurred from 7th-on. >> Most reviews occurred on Sundays; Weekend series (Fri-Sun) featured 51% of all replays. >> The most common reason for review was Out/Safe (Force - 1st) followed by Out/Safe (Tag - In). Most & Least Accurate Umpires, Replay Review (sorted by Review Affirmation Percentage [RAP]). 1. Chad Fairchild, Dale Scott, Ryan Blakney, Pat Hoberg, Sean Barber - 100% RAP. 6. Alfonso Marquez - 91.7% RAP. 7. Vic Carapazza, Marty Foster - 83.3% RAP. 9. Bill Miller, Chris Guccione - 77.8% RAP. 11. Shane Livensparger, Ramon De Jesus - 75.0% RAP. 13. Quinn Wolcott, Joe West, Phil Cuzzi - 72.7% RAP. 83. Brian O'Nora, Andy Fletcher, Kerwin Danley - 16.7% RAP. 86. Lance Barrett - 14.3% RAP. 87. Dana DeMuth, Nic Lentz, Ron Kulpa, Gerry Davis - 0.0% RAP. 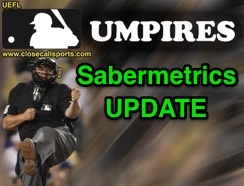 For detailed sabermetric analysis of MLB umpire ejections and instant replay review outcomes, including a Replay Review umpire leaderboard, follow the "read more" link below. Total Games Played Through May 31, 2017: 1,198 of 2430 (49.3% of the season has been played). Ejections: 88. (Compare to 93 through June 2016). Pace is 178 ejections / 2430 games played. "Team most active" (Team with most Ejections): CWS 10; LAD, MIA 6; BOS 5; TOR, TB, OAK, NYY 4. "Team least active" (Team with least Ejections): BAL, CHC, HOU, PHI 1. "Manager ejections leader" (Most Ejections): Rick Renteria 5; Don Mattingly 4; Gibbons, Banister 3. "Player ejections leader": (35 Tied) 1. "Umpire leader" (Most Ejections): Bill Welke 5; Torres, Holbrook, Emmel, Cuzzi 4. "Crew most active" (Crew with most Ejections): Holbrook 11; West, Hallion 8; Emmel, Everitt 7. "Most accurate umpire" (Umpire with greatest QOC): Fieldin Culbreth (3 Y / 0 N + 0 U = 1.000 QOCY). "Overall QOC percentage" (Overall QOC Y value): .630 (46 Y / 27 N) + 15 Irrecusable = 88 Total. "Team Status Pre-Ejection" (Winning-Losing-Tied [W-L-T] Record prior to Ejection): 18-55-15. "Team Status Post-Ejection" (Game Record [W-L]): 30-58. (Delta: 12-3; WPCT: .800). By Inning: 7 (15); 8 (14); 5 (12); 6 (11); 1, 9 (10); 3 (6); 2, 4 (5). By Reason: Balls/Strikes (42); Replay Review, Check Swing (7); Throwing At, Fighting (6); Balk (5). By Day of Week: Sat (18); Sun, Fri (15); Wed, Thurs (12); Mon (10); Tues (6). Replay Reviews & Decisions Rendered: 669, .510 RAP (341/669). On pace for 1357 replays. "Team Most Used" (Used Replay Review most often): TB 40; TEX 38; ATL 28; TOR 27; SD, MIL, CHC 26. "Team Least Used" (Least use of Replay): WAS 14; BAL, CWS, DET, MIA 16; CIN, KC, OAK, PHI, SF 19. "Most successful team in review" (Team with highest TSP): Royals - .737 (14/19). "Least successful team in review" (Team with lowest TSP): Blue Jays - .296 (8/27). "Umpire most questioned" (Most Replay Reviews): Clint Fagan 15; Timmons 14; Holbrook, Eddings 13. "Crew most questioned" (Most Reviewed Crew): Ted Barrett 41; Winters 40; Nelson, Holbrook 38. "Most accurate umpire" (Umpire with greatest RAP): Chad Fairchild - 1.000 (4 Y in 4 Total). "Ump of greatest overturn" (Umpire with lowest RAP): Dana DeMuth - .000 (0 Y in 4 Total). - By Inning: 7 (101); 8 (96); 9 (78); 4, 6 (67); 1 (65); 5 (60); 3 (58); 2 (57); Extras (20). - By Reason: Out/Safe [Force - 1B] (174); Out/Safe [Tag - Into Base] (122); Out/Safe [Tag - SB] (57); Out/Safe [Pulled Foot] (49); Out/Safe [Tag - Pickoff] (33), HBP/No HBP (31); HR/In Play (30); Catch/No Catch (22); Slide INT, Out/Safe [Force - Second] (21). - By Day of Week: Sun (127); Fri (110); Sat (104); Tues (92); Wed (86); Thurs (83); Mon (67).